Well, I've loaded up the first small batch of 30.30 and .243 with Trail Boss to see how they perform. 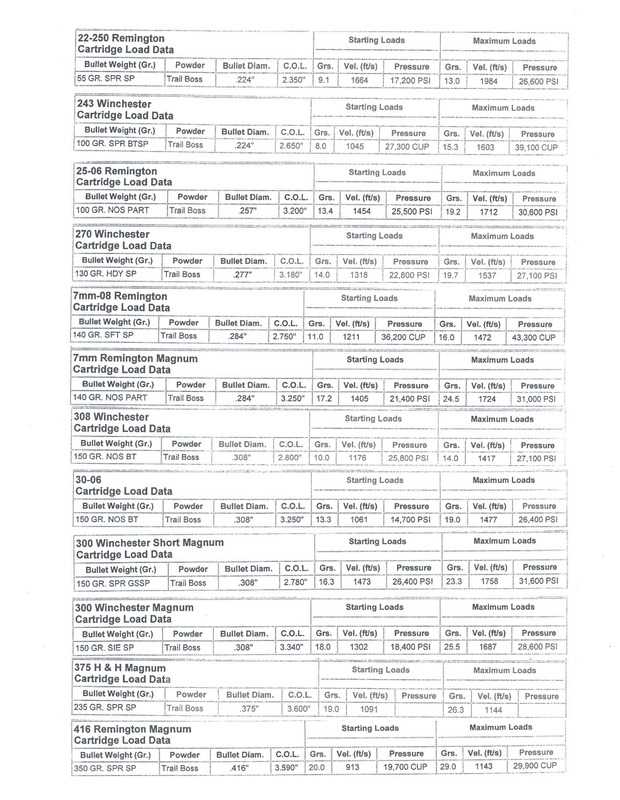 Only loaded six of each calibre in lots of two rounds at .5 grain difference between lots. The idea behind this is to just get an idea of how the powder performs before I start some reasonably serious load development. I have been told that the 30.30 loaded with Trail Boss and 150 grain cast boolits is good pig medicine. The majority of loads will be very close to being subsonic (below 1100fps) so it will be interesting to see the performance...especially considering in the .243 I am using 80 grain jacketed boolits. They say that you can use either cast or jacketed boolits with Trail Boss reduced loads, but the powder is best suited to the cast variety. Will post more once I have had the opportunity to send some downrange. Had intended to do it tomorrow, but my shooting buddy can't make it now. Also have to look at acquiring a chrono to check velocities. Vince, I think you will have a good experience. I loaded up 20 grains in my .270 Win behind a 150gr bullet and got a 1590 mv. The case was full. Nice not having the recoil or muzzle blast. Sounds good Slim. 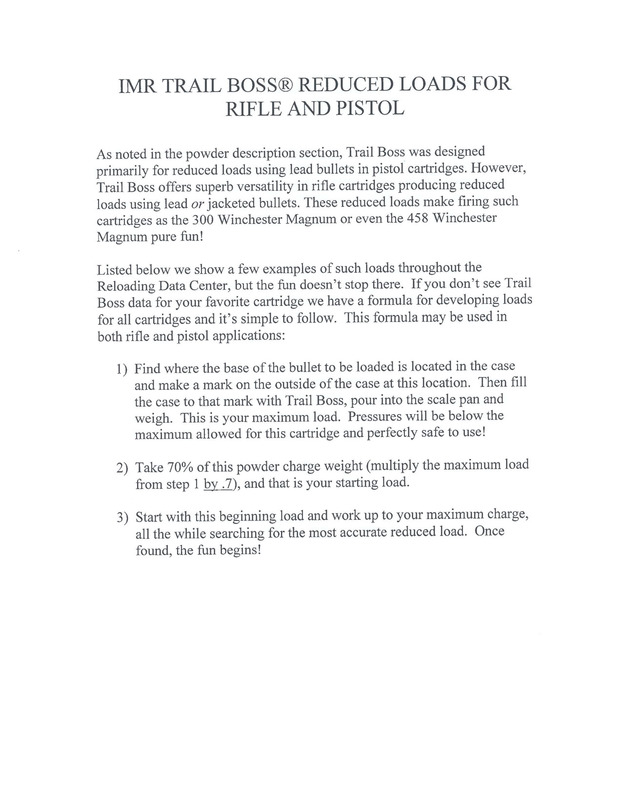 I am expecting good results from the Trail Boss loads. Time will tell. Humph!! Nothing better for the soul then recoil therapy of 32 grains of W-748 under a 170 grain Speer FNSP from a .30 WCF. My big bro has just started using some in his .308,he said accuracy is good so far but hard to get head around single digit load data and a nearly full case. Will be real interested to see how it turns out. I would like to use it in my 1875 replica Remington revolver. I was also looking at VV Tin Star powder but it is expensive and I can only find one supplier who stocks it and they have minimum order requirements. I checked my Lee powder VMD chart (Volume of one grain of powder in cubic centimeters). The value for Trail Boss is .2172 cc per grain and by comparison for Win 231 is. .0931. Thats over 2x the volume for the same weight of powder. The weight of powder for a 230 grain lead bullet is closer at 5.5 (685 fps) and 5.8 (738 fps) respectively. These are published values, not my own measurements. The pressure spike does goes a bit higher than what I am comfortable with. Make sure your barrel is clear before loading another one Vince. I don't think you will have that issue if you load the case up. Vince, do you have this load data? I was pleased to see how my 20.0 gr load in my .270 was so close to their data. Thanks Gelan. A projectile that didn't clear the barrel is a major concern and I will be watching diligently mate. Yes Slim...I have this data, and I cross checked the ADI data against this data as well as using their suggestion of checking for the max load. Mac...Trail Boss is a bulky powder, in fact I was surprised to see that it takes the form of pieces of "shaved cylinder". Bushy, I agree mate, recoil is necessary for worthwhile "therapy", but for paper punching it works out much less expensive. It may also give me a little more case life if the pressures are down. Trail Boss is a bulky powder, in fact I was surprised to see that it takes the form of pieces of "shaved cylinder". Looks like tiny doughnuts. 20 grains just about fills a .270 case so its about a 1/3 the weight of smokelss powder. Vince, I would think the best way to prolong your brass would be to develop loads at the minimum powder weigth range with normal smokeless powders and anneal your brass after about 4 firings. Work hardingin should be the primary factor to shorten life. I'm going 12 or more reloads with my .270 near max loads with my biggest issue being the progressive worsening of neck thickness that causes concentricity problems. Somewhere between a minimum and maximum load there are usually two (sometimes more) accurate loads (loads that fall on the correct harmonic). I rarely anneal my cases and have loaded some of them over twenty times. That's my 3006 - neck size only and shooting about 97% of max with H414. Thanks Slim. I load .5 grain below max which should help a little, but I check for stretching every time I load the .243 cases, but after only two or three loads I haven't found anything yet. How dirty is it? I hate cleaning the cylinder and around the cone on my revolver after using Clays. W231 and VV N340 aren't as bad. If Trail Boss is clean I just may add it to my next order, assuming it is available, so many powders are still in short supply. Not sure yet Mac...although I won't have to worry about cleaning a cylinder face...been there, done that. I load .5 grain below max which should help a little, but I check for stretching every time I load the .243 cases, but after only two or three loads I haven't found anything yet. As far as I am aware, there is no "max" with Trail Boss. You can see the chamber pressure in the chart. Its typcially half to 2/3 that of modern smokeless powder. for .243, .270, .30-06, etc, fill the case and enjoy.